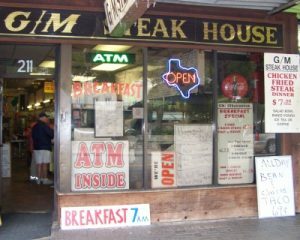 I wouldn't claim that San Antonio's G/M Steakhouse is the oldest continuously operating diner and purveyor of fast food, in all it's infinite varieties and greasy-grilled glory, but at fifty years and apparently going strong, it's definitely in the running. This, my children, is what fast food used to be, before the days of Micky D's, BK and Wendy's drive-up window open to all hours. This fountain of classic fast-food delights - hamburgers, fries, grilled sandwiches, breakfast tacos and chicken-fried steaks (plus all sorts of other steaks) is just across Alamo Plaza from another classic San Antonio institution of slightly longer duration, the Menger Hotel. My daughter and I had lunch the Menger Hotel last weekend, after looking over the Alamo historical re-enactors in the gardens behind the Alamo. Although the G/M isn't a classic diner; one of those early 20th century pre-fab restaurants on wheels, the kitchen set-up is reminiscent of one. 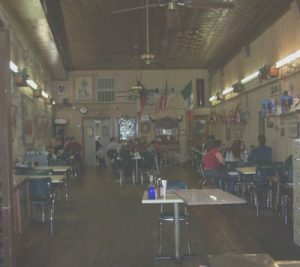 There is a single narrow lane of cooking area, right by the entrance, a wide grill and deep-fryer, the case of cut slices of pie and cakes on display, and a menu on the wall above - a menu of breakfast, lunch and dinner items.The breakfast and lunch specials are on the inexpensive side; this may very well be the cheapest sit-down place to eat on Alamo Plaza, even cheaper than the Subway, a couple of doors down.And the Subway probably doesn't have as interesting a place to sit and eat. It's an interesting jumble of a classic tall 19th century space with a pressed-tin ceiling, plain mid-20th century diner tables and chairs, and shelves and cases along the walls filled with military memorabilia, photographs and relics. The current owner has a large collection, only part of which is on display. They updated the menu prices at the beginning of the year; most breakfast items are under $5.00, most lunch selections are well under $10.00 - and the décor can't be beat at any price. The G/M is at 211 Alamo Plaza, and is open from 7 AM, every day but Tuesday. Cut 1lb round steak into four portions and pound until thin. Marinate resulting cutlets in the juice from a 4-oz can of sliced jalapenos, for at least half an hour. Combine in another flat pan: 2 beaten eggs, and 2 cups milk. In a large flat skillet or electric fry pan, fry 5 strips bacon, and when done, remove bacon, reserving rendered bacon fat. Add cooking oil as needed to fry the steaks. Dip marinated steaks, first in the milk-egg mixture, then coat with flour mixture. Fry steaks at 350 degrees, until done, at 350 degrees. Garnish with crumbled bacon and serve with milk gravy. 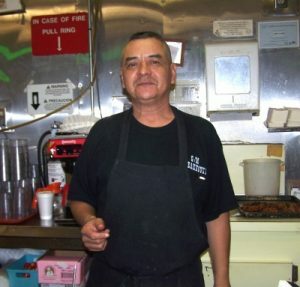 Other classic Texas recipes are found here - Garry's Home Cookin' Eat first, ask questions later!